EXCELLENT QUALITY: These flashcards are made of high-quality material. These cards are heavily water-resistant (as far as spilling coffee on them or dropping one into the mud). The thickness of the flashcards is 130 lb and measures 3.5" x 2.5" in size. 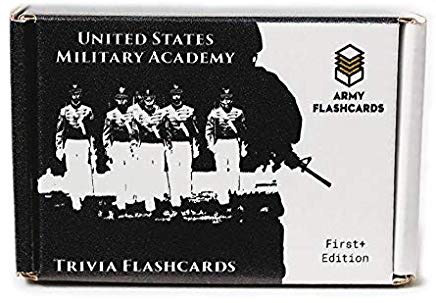 WIDE RANGE: This deck of 100 flashcards consists of a wide range of the most fascinating facts, myths, and legends about the United States Military Academy. Explore various West Point topic categories to include Sports, Cadet Life, History, Military, Architecture, Leaders, and Myths (with a touch of Horror). POCKET SIZE: The USMA Trivia Flashcard deck is designed very carefully so that it travels easy and endures endless hours of fun. The cards are not too big, nor too small and can be easily kept in your pocket. They come in a corrugated cardboard box with a Dreamcoat gloss (think hard gloss shell), meaning they'll hold up anywhere. 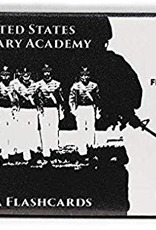 EDUCATIONAL AND INSPIRING: Whether you are an Alumni, current cadet, or just a visitor, this flashcard set is sure to enhance your West Point experience. USMA has a rich, awe inspiring history, which can often go unknown unless you seek it out!